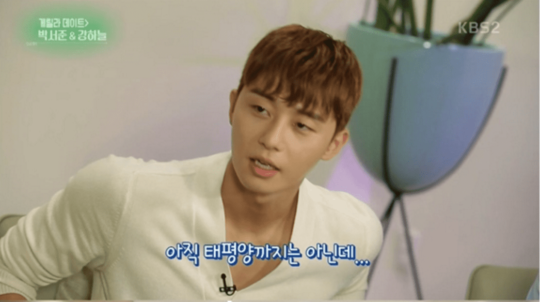 Few would be able to tell that actor Park Seo Joon, who has been in the spotlight recently for his portrayal of a playful boyfriend, used to be an intensely shy teenager. In the recent hit drama series Fight! My Way, Park plays the spirited Dong-man, a boy-next-door type character who remains boisterous despite numerous setbacks in life. Park will soon make his movie debut in the police-buddy flick Midnight Runners as the energetic cop trainee Ki-joon who leaps to action before thinking. Both characters are the epitome of unquestioningly confident youths with nothing to fear. The real-life Park, however, was not so self-assured, he confessed. Park decided to begin acting in middle school as a means to escape his crippling shyness, he said in an interview. “I couldn’t even order food at a restaurant, I was so embarrassed,” Park, 28, said of his younger days. So Park joined the animation club at his school and participated in his first cosplay event at a school arts festival. Park went on to study theatre at Kyungpook National University and made his first drama appearance in the 2012 series Dream High 2 at the age of 24, unlike many actors these days who begin acting in their teens. Park then starred in the sitcom Pots Of Gold as the spoiled son of a wealthy family and proved himself a talented romantic lead in the 2014 drama Witch’s Romance. His success came gradually rather than overnight; he began to slowly rise to stardom through the 2015 dramas Kill Me, Heal Me and She Was Pretty, and the 2016 period piece Hwarang: The Poet Warrior Youth. His performances were lauded as unforced and natural. Having come into fame only in recent years, Park says his years as a “very ordinary” 20-something help him deliver detailed renditions of struggling Korean youths. In Midnight Runners, which opens in South Korean theatres today, Park plays a budding cop-in-training full of “passion, tenacity and sincerity,” he says. In the film, Ki-joon and his fellow trainee Hee-yeol, played by Kang Ha-neul, chase kidnappers barehanded and without formal police experience, with the sole goal of bringing justice to the world. Park’s chemistry with Kang was pivotal to the comical, youthful rhythm of the two protagonists in the film. “We instantly got along. … We might have led different lives but the way we think is very similar,” he said of Kang, who started out in musicals before moving on to dramas and films.